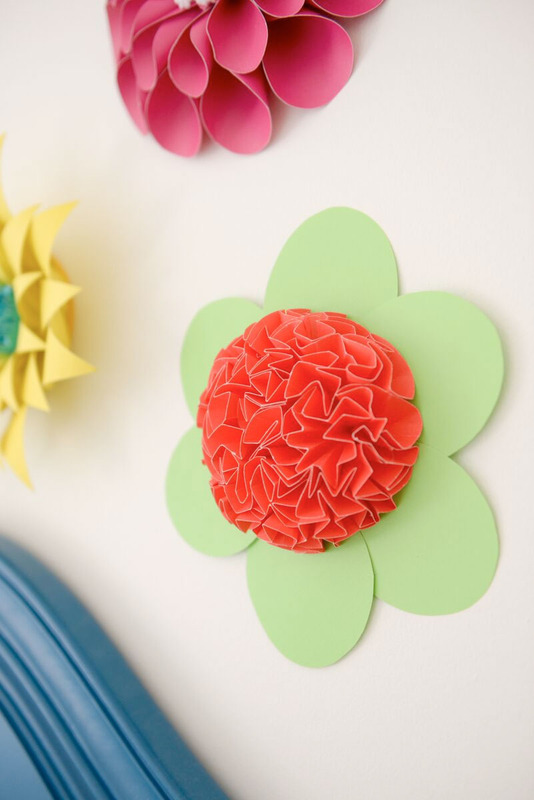 Keep things fresh with some paper flower wall adornments. The oversized flowers will be a topic of conversation all season long! Cut out the amount of paper petals and flower pieces as listed on the template pieces. Set the circles aside. Beginning with the first petal, roll it in beginning at the sides and going in towards the pointed end, overlapping them slightly about 1/4” to create a cone shape. Adhere them together. Roll the other petal pieces the same way. Place the larger rolled petals around the round flower base it, spacing them out so all petals will fit on the base. Once desired look is achieved, glue the petals in place to the base. Adhere the center round circle in place, then cover it with the pom-poms. To make the petals easier to roll, use the edge of a pencil to breakdown the paper fibers just slightly so that they work into a rounded cone with less effort. Try making cones in a variety of colors for one flower—that will definitely bring a pop of color to the décor. Reduce or enlarge the template pieces in size to create larger or smaller flowers.